Synopsis : Device reads brain signals and converts them into motion allowing stroke patients to use their minds to open and close a device fitted over a paralyzed hand. A brain–computer interface BCI, mind-machine interface (MMI), direct neural interface (DNI), or brain–machine interface (BMI), is a direct communication pathway between an enhanced or wired brain and an external device. BCI's are often directed at researching, mapping, assisting, augmenting, or repairing human cognitive or sensory-motor functions. Due to the cortical plasticity of the human brain, signals from implanted prostheses can, after adaptation, be handled by the brain like natural sensor or effector channels. Currently the most widely used neuroprosthetic device is the cochlear implant which has been implanted in over 220,000 people worldwide. "We have shown that a brain-computer interface using the uninjured hemisphere can achieve meaningful recovery in chronic stroke patients," said Eric Leuthardt, MD, a professor of neurosurgery, of neuroscience, of biomedical engineering, and of mechanical engineering & applied science, and the study's co-senior author. Stroke is the leading cause of acquired disability among adults. About 700,000 people in the United States experience a stroke every year, and 7 million are living with the aftermath. In the first weeks after a stroke, people rapidly recover some abilities, but their progress typically plateaus after about three months. "We chose to evaluate the device in patients who had their first stroke six months or more in the past because not a lot of gains are happening by that point," said co-senior author Thy Huskey, MD, an associate professor of neurology at the School of Medicine and program director of the Stroke Rehabilitation Center of Excellence at The Rehabilitation Institute of St. Louis. "Some lose motivation. But we need to continue working on finding technology to help this neglected patient population." David Bundy, PhD, the study's first author and a former graduate student in Leuthardt's lab, worked to take advantage of a quirk in how the brain controls movement of the limbs. In general, areas of the brain that control movement are on the opposite side of the body from the limbs they control. But about a decade ago, Leuthardt and Bundy, who is now a postdoctoral researcher at University of Kansas Medical Center, discovered that a small area of the brain played a role in planning movement on the same side of the body. A person whose left hand and arm are paralyzed has sustained damage to the motor areas on the right side of the brain. But the left side of the person's brain is frequently intact, meaning many stroke patients can still generate the electrical signal that indicates an intention to move. The signal, however, goes nowhere since the area that executes the movement plan is out of commission. "The idea is that if you can couple those motor signals that are associated with moving the same-sided limb with the actual movements of the hand, new connections will be made in your brain that allow the uninjured areas of your brain to take over control of the paralyzed hand," Leuthardt said. 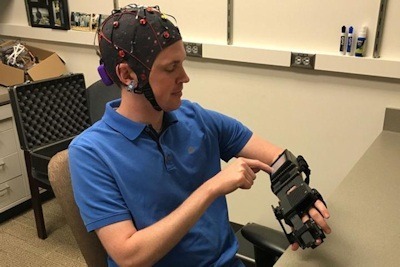 Medical resident Jarod Roland, MD, tries out a device that detects electrical activity in his brain and causes his hand to open and close in response to brain signals. A new study shows that this device can help chronic stroke patients recover some control over their paralyzed limbs. Photo Credit: Leuthardt lab. That's where the Ipsihand, a device developed by Washington University scientists, comes in. The Ipsihand comprises a cap that contains electrodes to detect electrical signals in the brain, a computer that amplifies the signals, and a movable brace that fits over the paralyzed hand. The device detects the wearer's intention to open or close the paralyzed hand, and moves the hand in a pincer-like grip, with the second and third fingers bending to meet the thumb. "Of course, there's a lot more to using your arms and hands than this, but being able to grasp and use your opposable thumb is very valuable," Huskey said. "Just because your arm isn't moving exactly as it was before, it's not worthless. We can still interact with the world with the weakened arm." Leuthardt played a key role in elucidating the basic science, and he worked with Daniel Moran, PhD, a professor of biomedical engineering at Washington University School of Engineering & Applied Science, to develop the technology behind the Ipsihand. He and Moran co-founded the company Neurolutions Inc. to continue developing the Ipsihand, and Leuthardt serves on the company's board of directors. Neurolutions funded this study. After 12 weeks of using the device, the patients' scores increased an average of 6.2 points on a 57-point scale. "An increase of six points represents a meaningful improvement in quality of life," Leuthardt said. "For some people, this represents the difference between being unable to put on their pants by themselves and being able to do so." "As the technology to pick up brain signals gets better, I'm sure the device will be even more effective at helping stroke patients recover some function," Huskey said.